Seattle is extremely well connected via direct international, transcontinental and regional flights. Seattle Tacoma (SEATAC) is a relatively short hop away from the city, with excellent mass transit, taxi and Uber options. The LINK Light Rail is very easy to use and takes you right into the heart of Downtown in less than 45 minutes, with some great views along the way. An Uber or taxi will run about $30 each way to most downtown areas, depending on time of day. Once in the city, so much of it is walkable – even if you may require an umbrella. 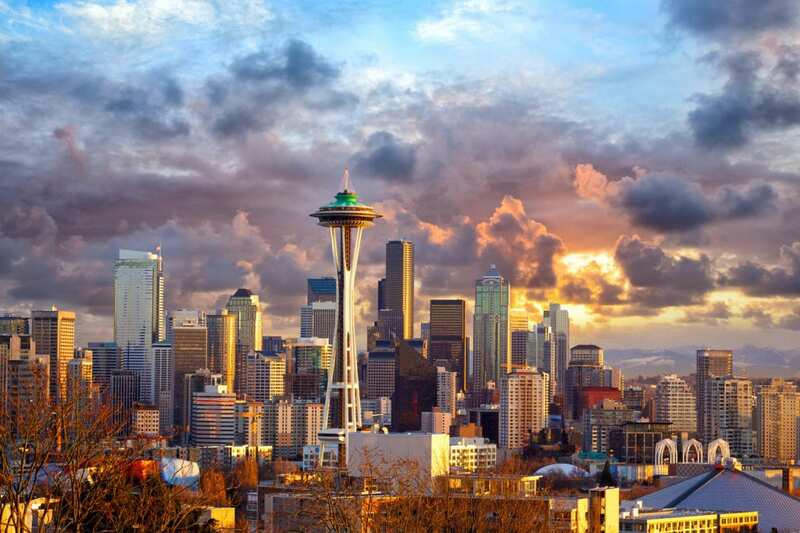 Seattle offers excellent accommodations for all styles and budgets. For quirky luxury, it’s tough to beat the Kimpton Palladian, Edgewater or Hotel Max. For old world luxury your best bets are the Four Seasons or Fairmont Olympic. If budget is more your game, the Hyatt House Downtown, the Maxwell by StayPineapple or the Inn at El Gaucho are great choices. Plus – there are tons of Airbnb options at all price points. It’s hard to beat Portage Bay Cafe, and with two locations it’s fairly easy to find. For an indulgent weekend brunch which may have you fed for days to come, take the King County Water Taxi from the downtown waterfront over to West Seattle over to Salty’s on Alki. It’s fairly pricey at $45+ per person, but you’ll find fresh fish, oysters, chef stations, immaculate pastries and incredible views of downtown. If a coffee is all you’re after – you’d be hard pressed to find a bad one. Seattle takes their coffee more seriously than most and any quaint cafe from the University District to Queen Anne will get you caffeinated. Shoot for Dubsea, Elm Coffee Roasters, Caffé Umbria, or Sound and Fog for a guaranteed good drip. There’s plenty to do downtown, but venturing out around the walkable city is the best way to spend your time. Upper Queen Anne Street offers incredible boutiques, cocktails, eateries and local wine merchants and is easily the perfect place to spend an afternoon. For your cultural needs, The Dale Chihuly Garden & Glass Museum is right next to the iconic Space Needle and is truly stunning, even if you’re not an “art” person per se. Especially for a first time visit, Pike Place Market is a rite of passage, where you’ll find all things fish, fun and manic under one “roof”. Oh, and if you’re looking to boost your Instagram likes, heading over to West Seattle is a perfect place to watch the sunset over the downtown area, with the space needle neatly tucked into frame. A ferry trip is also a must, but they need their own paragraph. If you’ve got just 48 hours to explore, the ferry to Puget Sound maybe your quickest best, but if you want the full experience you should really day trip it a bit further. A Clipper Ferry to San Juan Island, or Victoria, British Columbia is an absolute must. The entire journey is a beautiful thrill ride of whale watching with jaw dropping landscapes galore and is easily doable as a day trip. Just Google the San Juan Islands. Your page will soon be filled with Killer Whale (Orca) pictures and magnificent coastline. If you make it all the way to Vancouver, you’ll want at least 48 hours there too! And if you roll like that, you can even combine one way sea plane and one way ferry to save some time. If you’re into ethnic food, you’ll love Seattle. There are vibrant immigrant communities ensuring only the most authentic Thai, Vietnamese, Chinese, Japanese and Ethiopian food. For Thai, you’d be hard pressed to find better noodles than The Patio, for Vietnamese – Ba Bar on 12th is both phenomenal and affordable. For authentic Chinese – you’re really and truly spoiled. Xi’an Noodle, Qian Noodle and Lionhead offer Chinese food so good you’ll swear you’re 5,000 miles away. If you’re looking for something more North American or European, a nice walk up Queen Anne Street to the legendary Mezcaleria Oaxaca, Grappa or Zeeks Pizza will do you well. For an after lunch treat, cupcakes from Cupcake Royale are a tradition. The flavors are inventive, to say the least… in a good way. Seattle has everything. From high end international designer luxury to one off designer dens and second hand bargains it’s all there. On a pretty day, University Village is a sensational outdoor shopping plaza to kick things off. If you’re into more chic and unique shopping, it’s tough to beat the copious boutiques dotted along the Queen Anne, Capitol Hill and Belltown neighborhoods. Glasswing, Likelihood, Cairo, Horseshoe and Totokaelo rival any boutique in another major city – seriously – there’s curated, and then there’s these spots. Long story short, shopping in Seattle will satisfy even the most hipster culture cravings. If you’re just looking for a big H&M, Nordstrom or other retailer – stick downtown. Plane geek? You simply must visit the Boeing Factory. Sports fan? Catching a football, soccer or baseball game is an absolute must. Seattle fans are crazy, in the best way possible. If you’re a wine fanatic, Walla Wall, Washington is home to some of the finest Cabernet Sauvigon and red blends in the world, not to mention some unique white wines. Quilceda Creek’s Cabernet recently won a rare 100 point rating from Robert Parker. Unfortunately, the wine areas that are really worth visiting are an hour flight from Seattle, but make for a great overnight, if you happen to have an extra day on your hands. Mt. Rainier is a great side trip option, with amazing views of the Cascade’s largest mountain and stratovolcano. It’s a mere hour and a half drive from Seattle and is perfect for active lifestyle people looking for climbing, hiking or other nature activities. If you’re celebrating something, or looking for some truly fine dining there’s only one answer: Canlis. The restaurant is a Seattle tradition and offers a setting almost as spectacular as the city itself. It’s not cheap – but it’s worth it. For everything in between, you really can’t go wrong with The Walrus and The Carpenter for seafood, Spinasse for delectable Italian or Sushi Kashiba for high end Japanese. For something local, try Matt’s on the Market or Westward. Any of the lunch choices above will also make great dinner options. It’s tough to beat a night of freshly pressed corn tacos mad from scratch with delicious guacamole and Mezcal cocktails. Speaking of which, Foreign National, Bathtub Gin & Co, Pie Bar and Canon will undoubtedly fulfill your libation needs. What’s your favorite thing to do in Seattle? Thanks for this. Will be in Seattle for 3 nights next month so this really helpful. Can’t decide whether to do the Boeing factory tour. Have you been? Did the Boeing tour last September. Takes 2-3 hours, and Everett (where they make the big planes- 777, 787,747) is about a half hour north of downtown Seattle. As a plane geek I loved it; went with my wife, and she actually enjoyed it too. On the food front there are tons of great ethnic choices in Seattle. Last week we went to Danbo, a Japanese Ramen restaurant- they have about a dozen locations in Japan, but their Seattle restaurant is the only one in the US. It was delicious. It’s a small restaurant, so be prepared to wait. Hi! Many thanks 🙂 Great article. You’ve got very well thing right. Silver Cloud on Capitol is also a great lower cost option for hotels. Great location for a chain hotel and usually significantly cheaper than hotels downtown. Very close to a lot of food and drink options you mention.